Make sure you visit our sister restaurant at CreateYourSalad.com. 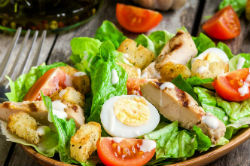 The Salad House features many mediterranean flavors, following in the family tradition, designed specifically to be both healthy and uniquely delicious. We call it "Garden Fresh Gourmet". We offer a full menu, starting with our Small Plates or Tapas, european inspired snacks like our Brinzini or Hummus Platter. Our signature salad creations include the Mandarin Chicken Salad, the Apple Walnut Salad, and the Man Salad. We also offer other hearty options like our Prosciutto Flat Bread Pizza, our Buffalo Chicken Wrap, or our Grilled Veggie Panini Sandwich with Fresh Mozzarella.